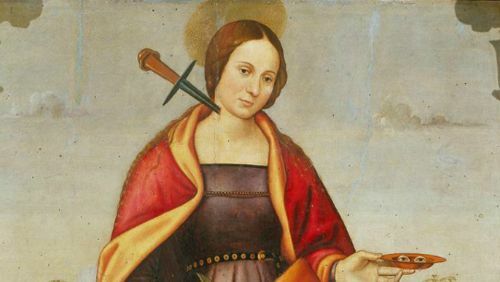 A virgin and martyr of Syracuse in Sicily, whose feast is celebrated by Latins and Greeks alike on 13 December. According to the traditional story, she was born of rich and noble parents about the year 283. Her father was of Roman origin, but his early death left her dependent upon her mother, whose name, Eutychia, seems to indicate that she came of Greek stock. With regard to her relics, Sigebert (1030-1112), a monk of Gembloux, in his "sermo de Sancta Lucia", says that he body lay undisturbed in Sicily for 400 years, before Faroald, Duke of Spoleto, captured the island and transferred the saint's body to Corfinium in Italy. Thence it was removed by the Emperor Otho I, 972, to Metz and deposited in the church of St. Vincent. And it was from this shrine that an arm of the saint was taken to the monastery of Luitburg in the Diocese of Spires--an incident celebrated by Sigebert himself in verse.